"I started working for Homeless Healthcare almost 8 years ago initially as their bookkeeper but given my enthusiasm for the cause, my role has expanded to include communications, marketing and now fundraising! 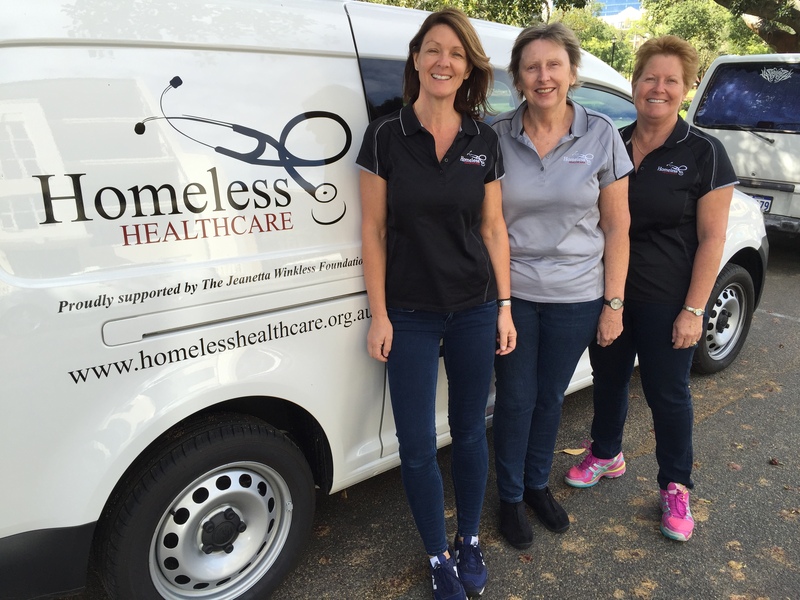 They are a charity dedicated to providing healthcare to the homeless and marginally housed people of Perth. Over the years I have been inspired by the amazing medical staff and their patience and dedication to the cause plus their ability to remain positive when faced with realities that are at times quite grim. Two and a half years ago Homeless Healthcare started their Street Health program with the assistance of start-up funds from Impact100. Street Health targets rough sleepers who are not engaged with any social or medical services in our community. They are found in the parks, public gardens, doorways and pavements of the CBD, and are among the most disenfranchised and marginalised people in our society. Rough sleepers have the worst health outcomes in our state with an average life expectancy of only 45 years and are notoriously difficult to engage because of their high levels of traumatic life experience. So as you can imagine, our nurses are pretty special people, full of empathy and compassion. Their initial focus is on engagement, gaining trust and encouraging rough sleepers to start using services such as drop in centres and Homeless Healthcare GP clinics. The nurses provide basic medical care on the streets like blood pressure and blood sugar checks, suturing of small lacerations and doing wound dressings. One patient recently said "Without Homeless Healthcare and its Street Health nurses I think I would be dead by now". They helped to stabilise her diabetes and connect her to mental health services. There are countless stories similar to this. Their work is valuable, often lifesaving and has prevented many costly Emergency Department admissions. We receive some funding from the Health Department for other services we provide but to date have had no success getting Street Health included. As of the 1st July 2017 our funding for the program ran out which is why we decided to crowdfund on Chuffed.org. After only 2 weeks of crowdfunding on Chuffed we managed to raise almost $23,000 which illustrates the level of public support there is for the program and enables our nurses to continue to provide care for another few months. Meantime we are doing all we can to secure funding from another source."